We are all creatures of habit to a certain extent. Some habits though, once discovered, are hard to break. Ours is all about a cycle ride along the front and a seafood lunch, many already know this is our drill. Its such a lovely thing to do, people watching, beautiful views, exercise and the reward of a chilled glass and some delicious seafood guaranteed. 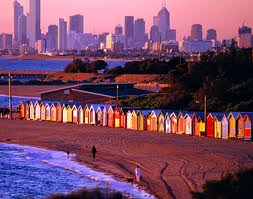 St Kilda is a great place. Really bohemian, quirky, funky, accepting, chilled and wired all at the same time. A really buzzy place where eccentrics can feel just like Darby and Joan and anything goes. We love it. Fantastic cake shops, the oldest in Victoria and we love how all the old recipes are still adhered to. My Papa in law is going to be in 7th heaven when he comes out here. Even I, who scoffs at cakes and such sweet things, was seduced by a cherry crumble cake! I know you can't believe it, there will be photographic evidence. We had to go back to Renan Goksin's Claypots, 5th time round. Well done on stocking the Yering Farm Chardonnay from the Yarra, sublime and buttery, my absolute number one! As for the food? I am going to use one of Renan's phrases "Gorgasm!" It's a bit bonkers inside and outside but I love that. I love the rustic chalk board menu, hurriedly written and not in the bestest handwriting. "this is what we've got today, take yer pick"
I love how everything is on display like a fishmongers, what you see is what you get, with a few bells on! Steamed King fish with Lime & Ginger and a pepper caponata. Nom! The build up has been ridiculous. Cometh the day, cometh the man. 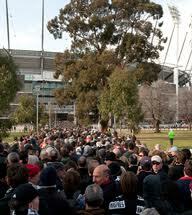 The Australian Football League is not just a sport but a religion here. It has all the marks of a religion, passion, weekly attendance, rituals, refusing other codes, hymns, membership, and sadly conflict at times. 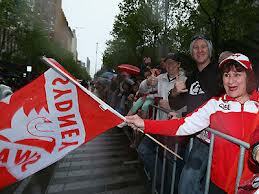 Whether male, female, young or old, the Aussies go nuts for their footy. 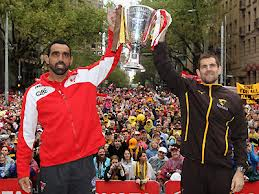 Today is the GRAND FINAL between Hawthorn (Hawks) and Sydney (Swans). The air is tingling, it's the only thing you see and hear about, everywhere you go.....and has been for weeks. I can't tell you what a huge event in the calendar this is. Shops and restaurants close or make a big deal of the fact that they are open but will be showing the game. Businesses close for the day, the gym I go to is closing early and the roads will be empty. It is far bigger than the FA Cup Finals back home, I think it is more akin to the Super Bowl in the USA. 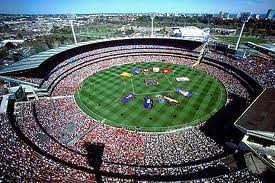 The finals are always held at the Melbourne Cricket Ground (MCG), there is always a massive Grand Final Parade through the city the day before and thousands pour onto the streets and everything grinds to a halt. That happened yesterday and in spite of the Spring downpour, spirits were not dampened. Last night there was a massive, free, Grand Final Rock Concert at the MCG and people started queueing overnight for a seat in the ground. 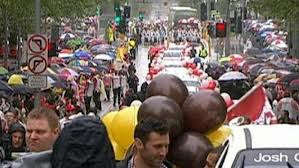 There will be gatherings of "mates" and families and hundreds of BBQ's lit all over Southern Australia today. More beer and more pie n sauce (the obligatory fare) will be consumed today than on any other day of the year. 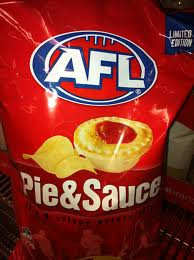 The supermarkets have been selling AFL special addition "pie n sauce" crisps and all in all it's pretty mental. 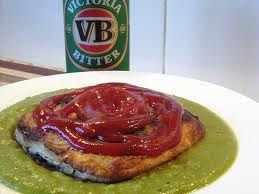 Meat pie, peas, ketchup and beer. The traditional fare for the Grand Final. YUK! There's no escaping it, so we will be backing Hawthorn "The Hawks!" So what do we think so far? 6 months in and a good time to look back and think about what I like and things I have observed about life here so far. 1. Aussies call a spade a spade and don't beat around the bush. 2. 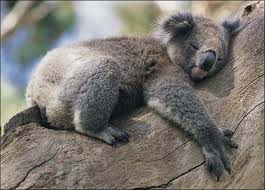 Australia is still refreshingly un PC, the fun police are on on the fringes but they haven't spoilt the party yet. 2. More beaches and coastline than any other country on the planet. The quality of sand and surf is amazing. 4. Aussies don't care where you come from - everyone gets treated the same, no matter who you are. So don't expect to be treated any differently on any kind of status grounds. It doesn't work like that here. 5. 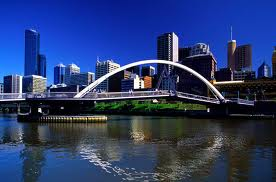 Australia is #2 on the quality of life index and most of the major cities regularly get into the top 10 most liveable cities in the world. Melbourne is always up there. 6. You can spend a lifetime exploring the natural wonders of Australia and still barely cover 10% of the continent. Fantastic for wander lusting adventurers like us. 7. Great countries to visit from here too (Japan, Malaysia, Thailand, Vietnam, India, New Zealand, Pacific Island Paradises) and so easy to get to. 8. If you want space to swing a cat , there are places where there is not a soul to be seen for hundreds and hundreds of kilometres. We really like that. 9. The weather generally is lovely one day, perfect the next. You can't knock the climate. 10. On the whole, people are incredibly friendly and helpful and the older generation still commands respect from the young. 11. If you forget someones name, just call them mate and no-one will bat an eye lid. 12. You hear just about anything on the airwaves and you won't be bleeped out (television/radio). That really takes some getting used to and the politicians do not dance around each other, full verbal blows are traded. 13. Aussies work hard, play harder. Customer service is fantastic. 14. The class system is not as defined here. At big events you are just as likely to meet your local butcher as you would the Prime Minister, and nobody cares. 15. Amazing diversity of restaurants. 16. Incredible range of fresh produce across the board and very high quality. 18. 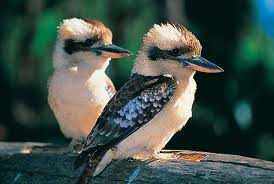 Stunning and captivating wildlife and birds with plenty that exist nowhere else on the planet. 19. 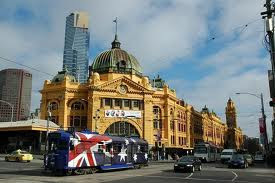 Always something great to do, festivals, sporting events, concerts, theatre, exhibitions.......every weekend in Melbourne brings something new. 20. 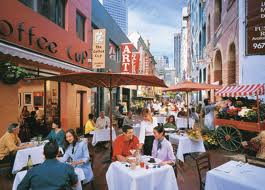 Fantastic coffee shops, being a Barista is a highly respected career and you won't get a bad coffee anywhere in Melbourne. It is a coffee mecca! 21. Aussies love their dogs! 1. Soooo far away from home. 3. The process of starting over and making new ones. 4. Christmas won't feel the same at all. 5. A proper British country pub and a Sunday roast thrown in. 6. Online shopping is rubbish. The UK has that licked by a country mile. 7. Generally clothes in the shops are not brilliant quality and very pricey unless you go top, top end, which I don't! 8. Driving is bonkers, hook turns, throwing a u-ey and undertaking are the norm and highly dangerous. There are a lot of car accidents here. 9. The TV is rubbish. Too many adverts and too influenced by poor American sitcoms, chat shows and I am sorry to say, reality TV. 10. Music on the radio is totally dominated by the American billboard charts, little room for indigenous break through artists. So on balance, the quality of life Down Under is very good. There are many, many reasons why Aussies should be happy and proud of their country and they are. Of course the social problems are here, drugs, alcoholism, domestic violence and crime, there isn't a country in the world that is immune from these issues as they all form part of the human condition, but wandering around the City, I just don't "feel" there is as much evidence of it. This could just be my personal perception rather than reality. It is such a tough gig back home right now and in Europe, your average Aussie could not even begin to imagine how hard it is for many people. Having never experienced a recession, high unemployment, high inflation etc, it must be difficult to grasp how these things impact. I suppose I am saying that living in such a stable democracy and economy means that people are generally happier. Aussies are not living with the angst, uncertainty and fear for what the future holds that is so evident in Europe right now. It has to make a difference. 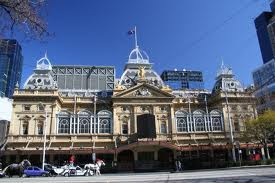 As for me and Hubster, we are lucky, for now it is a very nice place to be. We are thoroughly enjoying the experience and will continue to seize the chance to do and see as much as we can for the time that we are here. It is my nature to present a positive picture, as there is so much to be positive about however, the adjustment to ex-pat life must not be under estimated. This combined with some difficult personal stuff, my car accident and of course losing my mum has presented us with a challenging first 6 months. I am glad it's under our belt. Sunday morning and up at 6am to drive out to the beautiful Dandenong Ranges, to climb the Kakoda 1000 steps. Apart from a bit of intermittent ski fitness, I don't think I have ever focused on a proper fitness drive before. Mind you as middle age creeps on I realise it's probably not wise to just "wing" it any more! It's a big mountain and it's only 2 weeks away. 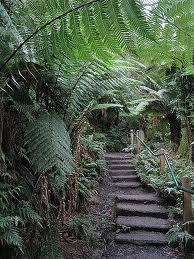 The steps are a memorial to the Australians who died along the Kakoda Trail in Papua New Guinea during World War II. Always amazes me what the human spirit will endure. Quite a story. As the name suggests, there are 1000 stony and deep steps that lead to the popular One Tree Hill. It is not an easy task by any means, many really struggle and others make it look ridiculously easy, but it does feel good when you get to the top. 1.8km up and down and I did it in 35 minutes, don't know if that's good or not but I know I gave it some welly. "I know, I'll do it all again!" I did as well. Numpty! It was stunning scenery in the rain forest with the kookaburras, rosellas and cockatoos all squawking encouragement, the native flora and fauna kept me interested and the strong scent of eucalyptus kept my mind alert. Back home and showered, I am now waiting for Hubster to come off the golf course and fire up the BBQ. I feel like I have earned ever morsel today. Hubster has bought a BBQ gadget for roasting whole chickens. The explanatory leaflet suggests you cook it with a "tinnie" in the middle of it! The aluminium cooks from the inside and the evaporating beer adds moisture and flavour. Roasted veggies in the bottom and job done. Delicious. Admittedly the "tinnie" was a proper gimmick and a waste of a good beer aka Hubster. 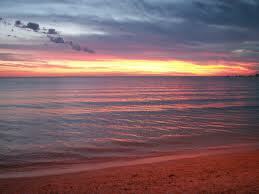 As a final flourish to our weekend we headed down to the beach to throw sticks for the boy and see the sun go down. Just me and my boys and it doesn't matter where I am in the world, happiness is; wherever and whenever we are together. Loving this collaboration from Guy and Lupe. I also know that I sing these words because they are the lyrics to a great tune that I love right now. They are however, the antithesis of how I strive to be. Run your fingers over them from time to time, because they make you real and sensitive to the world. They give you empathy but most of all, if you don't have them on show, you will become stronger. With the cinema just 5 minutes walk away I am enjoying being acquainted with the world of movies once more. I couldn't watch the opening scenes. A girl assuaging her guilt and relinquishing responsibility for her actions by seeking to blame another. Creating drama to deflect and smoke screen from a life that she finds unfulfilled and frustrating. Adolescent angst and single Mother's trying to cope. She coerces and manipulates in order to force an outcome. That outcome is not one she expected or wanted. It shows how we are culturally conditioned to respond in a particular way. Our conscience and truth is always with us regardless of the story we present to the world. But as for the battle scars, they ain't never going away, but yes they can change..... and for the better and this certainly happens to this girl. A haunting light and hue on the water today. Radder's first train ride and he made his mummy very proud. His celebrity status is now fully confirmed, lost count of how many times we were stopped and how many pictures people took of him. 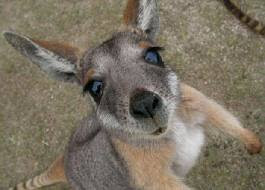 I adore animals, all animals and I have been guilty of refusing to read stories that I find too horrifying or upsetting. "I can't bear it, la la la, it's not real if I don't read it". That's me. Well, shame on me. It's not the right thing to do, not if I claim to love our 4 legged friends as much as I do. Please carry on.............don't stop now, the uncomfortable bit doesn't last long. 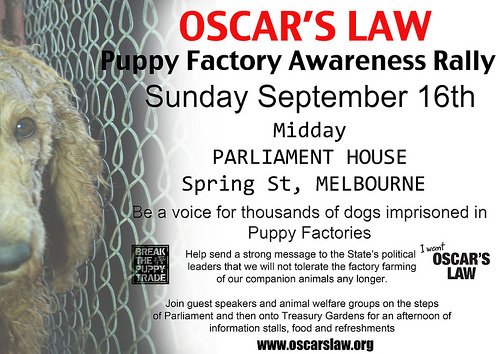 Imagine 1000 dogs locked up in a filthy, urine and faeced ridden shed. They have never seen the outside world, they were born in that shed and they will die in that shed. They will never know what it's like to chase a ball, go for a walk, play or enjoy a lovely belly rub. Mothers are continually mated over and over and over again. Constantly for years, non stop. Their poor bodies never get a chance to recover before they are mated again. These pitiful creatures are stripped of any dignity, their will and their souls wither and they eventually lose their minds and go insane. They are in perpetual pain, matted and disease ridden, they receive no veterinary help or medication and no-one heeds their cries. Dogs on puppy farms are breeding machines used to make their owners money. Puppy farmers will sell to anyone and by any means, on-line, through pet shops, via newspapers and car boot sales or by using a false house as a ‘shop front'. Do NOT buy a puppy unless you can view the parents and where it was born. Otherwise and quite innocently we contribute directly in keeping the wheels of this disgusting industry in motion. This is the ultimate betrayal of man's best friend and it is rife, not just in Australia, but all over the UK and the rest of the world too. We met some wonderful people, some incredible dogs and I am so glad I didn't turn away from that poster at the train station, for once I read it and was jolted into action. Radders and I are now fully fledged recruits of Oscar's Law and I realised ignorance is not bliss, it is a life sentence of hell for the very animals I adore and that is not acceptable to me. Awareness means there is hope, even if it doesn't work it is far better to know that I along with thousands of others at least tried. Why not add your voice. I know you care. Still on my bestest mummy! A comfy cushion, don't mind if I do.